The search for a missing 24-year-old Marine from Connecticut is being drastically scaled back three weeks after he was reported missing in California. U.S. Marine Corps 1st Lt. Matthew Kraft of Washington, Connecticut, was reported missing last month after he set out on a solo ski and hiking trip on Feb. 24 near the Kearsarge Pass Trailhead, more than 100 miles east of Fresno. He was scheduled to complete his trek by March 4, according to the Inyo County Sheriff’s Office. An extensive, multi-agency search began on March 4, when Kraft’s father alerted law enforcement officials that he had not heard from his son. The search included cell phone forensics, which showed that Kraft’s last phone activity was in Inyo County. The Marine Corps, nearly a dozen county sheriff’s departments, crews from two national parks and the California Highway Patrol assisted in the search of the 195-mile Sierra High Route in Central Sierra Nevada. “Backcountry snow instability and weather issues, including high winds, have been a significant challenge for search crews,” the Sheriff’s Office announced. 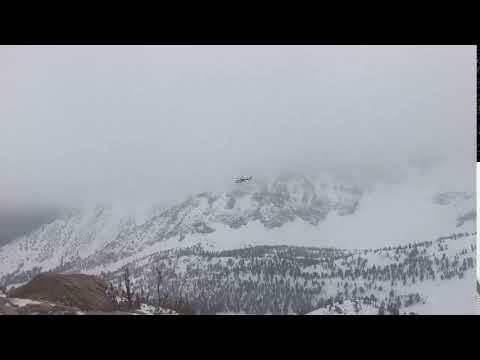 “Both aerial and ground searches have identified avalanche activity, cornices, and snow bridges throughout the wilderness, including along the Sierra High Route. The search zone has been determined to be larger than the state of Rhode Island. Kraft’s vehicle was located on March 8 in the Grays Meadows campground above Independence, California. According to investigators, an aircraft with thermal and night vision imagery capabilities has been flying the route and while several points of interest have been identified – all have been investigated and determined to be animal related. Search crews also employed RECCO technology, an electronic device to find people buried in an avalanche. Search and rescue authorities have been unable to locate evidence of Kraft’s location along his planned route, officials noted. Beginning Monday, March 18, InciWeb, the Incident Information System being used to relay regular updates, will go into inactive status, investigators noted.